Giving our best school librarians the recognition they deserve! The SLA School Librarian of the Year Award is the School Library Association’s prestigious honour that recognizes the excellent work of school librarians. 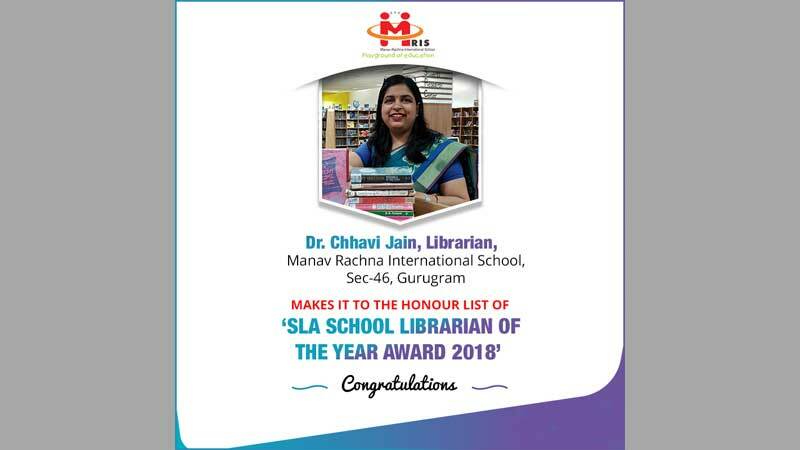 Four exciting and innovative librarians have made it to the Honour List for the SLA School Librarian of the Year Award 2018, including Dr. Chhavi Jain, Librarian, Manav Rachna International School, Sec-46, Gurugram. Dr. Jain manages a large, multilingual library and supports children aged 6-17 years. Dr. Jain is breaking down barriers and raising the profiles of school librarians in India with her innovative and rigorous approach to her work. Exemplary in her promotion of reading with numerous author visits (in person and via Skype), pupil awards and international collaborative projects, her enthusiasm, professionalism and passion for reading is recognised throughout the school.